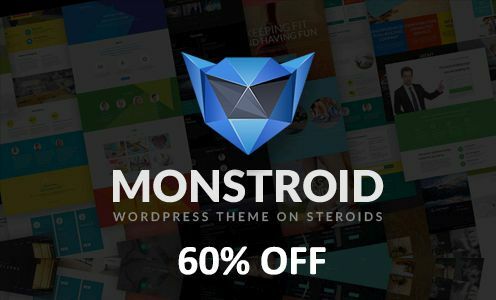 If you follow updates on our blog, you should have heard about Monstroid and the value it has for starting or redesigning your WordPress site. If you got interested in this product, then you should know that TemplateMonster sells this multi-purpose design for the set price of $79. However, this Black Friday the company couldn't have left you without a lucrative offer to get this multipurpose WP theme running on Cherry Framework 4 at a good discount. 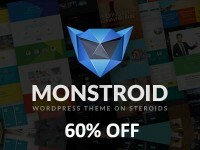 For 5 whole days, from November 25th and till November 30th, you have a unique opportunity to get Monstroid for $32 only! Isn't it fantastic? So why don’t you celebrate this Thanksgiving, Black Friday and Cyber Monday with a 60% discount? By the way, not only Monstroid, but other TemplateMonster templates are also on sale. If you were planning to start your website with a ready-made template but couldn't afford buying one earlier, then you simply cannot miss this hot deal. No matter what kind of a website you are going to start and what CMS you prefer the most, you can get any design from TemplateMonster at a 60% discount. Want to grab more than one theme and widen your collection of cool web design stuff with more professionally coded items? Not a problem. Download as many as you wish. Please note: No promo code is required. All prices have been cut by 60%. Enjoy TemplateMonster Black Friday Sale!